When a dish has many names then you know its a good staple to have in your recipe book. 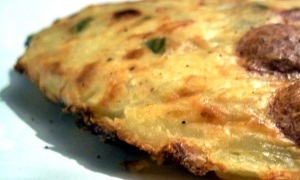 The Spanish Omelete, Tortilla Espanola, or Tortilla de Patata (potato omelete) are all names for the next dish. This is another amazing dish to make with friends, we first found the recipe when staying at a hostel with a group of Argentian guys who made this dish for a meal while watching a football (soccer) match. Loads of protein, cheap, and delicious. There are many varieties of this recipe, and the beautiful thing about it, is you can add whatever you have lying around into the dish. We’ve just got the basics here. But for the picture we added some sausages to the mixture. You can also add any vegetables you like, and cheese would also be a good addition. Enjoy and let us know your thoughts!!! 1) Slice potatoes into 1/8in slices. 2) Slice onions into similar size pieces. 3) Mix potatoes, onions, salt, and pepper in large bowl. 4) Add 2 cups of oil to frying pan, heat up on medium-high heat. 6) Once mixture is finished, pour it into the strainer to allow the excess oil to drip off. 7) While the oil is dripping off, crack eggs into large bowl and beat by hand with a fork. 8) Pour mixture from strainer into the large bowl and mix all ingredients together. 9) Heat 2 tablespoons oil in frying pan over meduim heat. 10) Once oil is hot, pour mixture into frying pan. 11) Cook until the bottom part of the mixture has browned (the side touching the frying pan) The middle will still be a little bit runny. About 3-4 minutes. 13) Over the sink, flip the frying pan and plate together. The omelete should fall onto the plate.. if it doesn’t you will be able to give it some motivation with the spatula. 14) Take the now empty frying pan and add 2 tablespoons of oil, bring back to the medium heat burner. 15) Once oil is warm, bring the omelete on the plate over and push it onto the frying pan with the spatula. The running side should be down. 16) Fry for 2-3 minutes and it will be ready to eat! 5 potatoes might be too many. If they’re medium, I’d use 5 medium potatoes and 4 eggs. Cut them in 3-4mm slices. Thinly cut the onion. NEVER mix the potatoes slices and the onions. They have different cooking times. Instead, use an extra pan and just 1 spoon of oil. Cook at low fire for 15 min. The onion will caramelize and would be smoother and tastier. Cook the potatoes as described. When done, mix with the onions and eggs. Add JUST salt, never pepper. Then, time to cook the tortilla. BUT NEVER LET IT GET BROWN!!! A good spanish omelet can be distinguished by being coocked on the outside and juicy on the inside, not raw, juicy. Its going to be like 2-3 min low heat. Use the plate to turn it around. And then repeat on the other side. You know its perfect when you cut it and its not dry, nor sticky.